When I’m asked that question, truth be told, I usually feel like I’m going to vomit a bit in my own mouth. Now, there are two primary reasons I hate that question. First, it always makes me feel dirty when somebody, who usually doesn’t know me, emails to inquire about me as a speaker and in that first email asks for my fee. I mean really, when you call a potential doctor would you say to the person on the phone, “And how much is the cost to deliver my baby?” Heck no. You’d wait until after the consultation to see if there’s a good fit, right? Second, I hate the question because the truth is it depends. Do you want me to deliver a keynote, a lunchtime presentation, a full-day training or a 3-day staff retreat? While I love a good money conversation, I’ve learned not to have it over email – if at all possible – and to instead get on the phone with a speaking lead and make them fall in love with me first. On that call, I also ask a ton of questions to understand exactly what is desired, usually share a few different possibilities for what the engagement could look like. (Unless it’s a conference or industry event where it is clearly a one-time only presentation, I usually propose a one-day, 3-day and quarterly possibility.) And then, I request 2-3 business days to send a proposal so that I can make sure I don’t say something I may regret later. Many of my clients, at the start of our work, bungle their first speaker bookings because they are just so delighted that they are being asked to speak. As a result, they often under price and commit to topics that require them to create brand new content (rather than staying in their lane and presenting what they are an expert on). Whether you are negotiating your own speaking agreements (which, after working with several agents and a business development team member I currently do because I do the best job on behalf of myself), or you have somebody doing this for you, it’s important not to rush the money conversation. Strive to get interested parties on the phone. Get them excited about you. And then, give them a proposal that blows their mind by giving them multiple ways to be able to engage with you as a speaker, trainer, facilitator, and/or retreat leader. 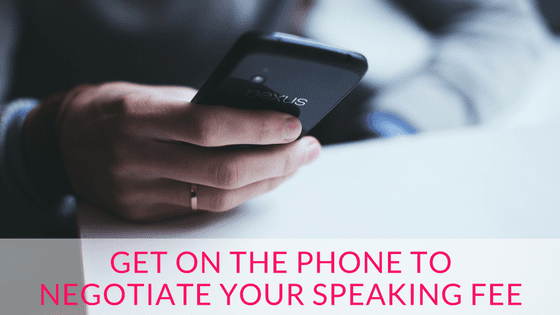 Do you have a specific question about your speaker negotiations? Hop into my Spotlight Speakers Salon Facebook Group and ask me.